Prince Cybi the Tawny was almost certainly born around AD 485 in the Callington region of Cerniw (Cornwall) - although Cuby (near Tregony) and Duloe are alternative claimants. He had a fine education and took a keen interest in Christianity even in his youth. At the age of twenty-seven, he made pilgrimages to Rome and Jerusalem and eventually became a priest, being consecrated bishop by the Bishop of Poitiers. On returning home, he found that his father, King Salom, had died and he was nominally the monarch of his country. However, Cybi had set his heart on a life dedicated to God and so, when he was formally offered the Cornish throne, he politely refused and Cerniw once more became united with Dumnonia. Cybi then began to travel the Celtic World. He founded churches at Duloe, Tregony, Cubert and Landulph in Cerniw. He later crossed the Bristol Channel to Edeligion in South-East Wales, with several followers (including St. Cyngar of Llangefni). The local King, Edelig, did not welcome them at first. Eventually, however, the monarch was brought round and gave the Cornishman two churches at Llangybi-upon-Usk and Llanddyfrwyr-yn-Edeligion. Cybi then moved on to Ireland (staying with his cousin, St. Dewi (David) at Mynyw (St. Davids) en route). He settled on the Island of Aran Mor where the Irish came to know him as St. Mo-Chop. After Aran, Cybi and his followers moved to Meath and then Mochop, but each time they were hounded by a local presbyter. So, Cybi sailed for Wales once more. He landed on the Lleyn Peninsula and lived for a while at Llangibi near Pwllheli. Here the local King, Maelgwn Gwynedd, came across him while out hunting a certain goat. Cybi used his charms to pacify the King's anger at finding an unapproved Christian community in his kingdom, and even persuaded him to give the saint one of his palaces, at what became Caer-Gybi on Ynys-Gybi. Cybi and his followers settled here and established a thriving monastery. The Cornishman became a firm friend of St. Seiriol who lived on the opposite side of Ynys Mon (Anglesey), and the two would often meet up for prayers at the Clorach Wells in Llandyfrydog in the centre of the island. This journey, with his face to the sun, allowed St. Cybi to nurture an enviable tan. Hence his epithet of 'Felyn'. 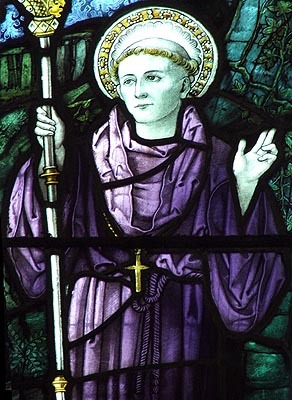 St. Cybi is said to have attended the Synod of Llandewi Brefi in AD 545, where his advice was sought by a number of priests hoping to make a pilgrimage to Ynys Enlli (Bardsey Island). The men were worried about Saxon pirates, but the saint persuaded them that if their faith was strong enough they had nothing to fear. While in Dyfed, Cybi founded the Church of Llangybi near Lampeter. He died on 8th November AD 555 and was buried on Ynys Enlli (Bardsey).